The Grundig M400 is an ultra compact portable radio that covers the AM (520-1710 kHz), FM (87-108 MHz) and shortwave in two bands: 5.9-10 and 11.65-18 MHz. The M400 features an analog circuit with digital display and has easy-to-use controls. 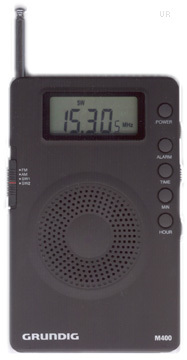 The frequency display is the the nearest 1 kHz on AM and to 5 kHz on shortwave. There is a built-in clock-alarm. The right side of the radio has the tuning knob and a power LOCK button to prevent accidental on/off. There is an earphone jack on the top panel. An amazingly thin radio ... under 1/2 inch! The built in 4 ohm speaker is 40mm wide. The collapsable telescopic whip is for the FM and shortwave bands, and does not need to be extended for AM band reception. This radio operates from two AAA cells (not supplied). With soft case and ear buds. Only 2.75 x 4.33 x 0.472 inches 3.2 ounces.